We have been asked to highlight the link to our Gardner 4T5 jigsaw that we originally sent out last April. We hope you enjoy completing it. The record for assembly to date is 4 minutes 29 seconds for this 50 piece puzzle. Let us know if you manage to beat that time. Check out the museum shop where we will soon have other jigsaws available, some with 260 pieces! When you open the jigsaw all the pieces are the right way up. That is, a piece with a straight edge at the top will go on the top etc. If you want to make the jigsaw harder you can rotate the pieces. To do this press Ctrl-P or use the Options - Preferences Menu, in the General Options Box tick Allow Piece Rotation. Warning, this will reset your jigsaw i.e. scramble all the pieces. So do this before you start to do the jigsaw. Double Clicking, or click once then press the Space Bar, on a piece will rotate it 90 degrees. Holding the Ctrl Key while clicking the pieces will select several pieces at once. Useful for moving all the Sky pieces to the top etc. The status bar shows you the time you have spent on the jigsaw, how many pieces in the jigsaw, how many are left and the percentage completed. You can Reset or Pause the clock from the Clock menu. By far the most popular option, turn the piece bevelling off - this greatly improves the quality of the image you are building. Do this by choosing Preferences from the Options Menu and unticking the Bevel the puzzle piece edges box. Ctrl-S Save Your Position - You don't have to complete the jigsaw in one session. You can Save and Load positions from the File menu. You also get asked if you would like to save your position when you close the program, as above. 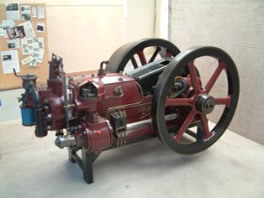 Thanks to negotiations between Geoff and Dr Robert Korving of the Technical Museum in Delft, the museum has just taken delivery of two beautiful and unusual gas engines on loan. These are an Atkinson and a Deutz engine. The Atkinson in particular, will be a welcome addition in helping us to tell the history of engine development. 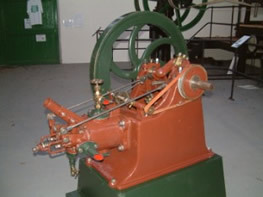 The engine, which was built by the British Gas Engine Company Limited sometime between 1886 and 1893, is one of only a very few Atkinson cycle engine known to have survived. It's serial number is 643. 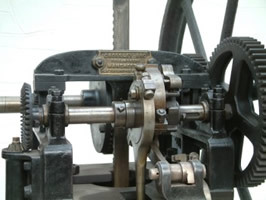 In 1882, a British engineer, James Atkinson invented the Atkinson-cycle engine. 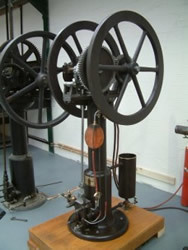 Atkinson’s engine had one power phase per revolution together with different intake and expansion volumes in an attempt to make it more efficient than the Otto cycle. It is designed to provide efficiency at the expense of power, and is beginning to see applications in modern hybrid electric applications. It is interesting to note that James Atkinson worked for Crossley Brothers for a while as chief engineer. He began in 1893 at a starting salary of £600. He retired in 1912 and died two years later. Over the closed months we have moved mountains! Well, not quite a mountain but certainly several hundred tons of shale that make up the "pit spoil" at the far end of the car park. Having reshaped this, the heavy equipment was then put to good use to level the car park. Several hundred tons of stone were then laid to make a solid base onto which the huge pieces of the Doxford engine were moved for storage until their restoration project begins. Other engines and equipment in the car park have been moved, including the 1908, 3-cylinder Campbelllater gas engine. The car park now looks huge so should improve parking for the many visitors expected over the coming months. We are very grateful to the local firms who sponsored the work by providing machinery to help our efforts. Paul J Jackson Plant Hire of Prestbury, for the heavy equipment to move the spoil heap and then flatten the car park and stone. Then to Andy McCarthy (member of our Friends association) who runs McCarthy Coaches in Macclesfield, for the loan of a Bedford truck and trailer to help us move the Campbell. For photographs please see the Gallery "Construction Work". 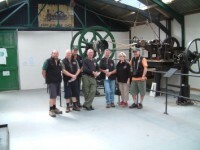 We are delighted to announce that in recognition of the museum’s support over many years the committee of the Five Counties Vintage Machinery Organisation (FCVMO) have given us a very generous donation to help with our ongoing projects. The committee came along to the museum last October and were so impressed with the work we are carrying out, told us we would be receiving a donation from them. The Treasurer delivered the cheque earlier this year to the delight of the Trustees. Bowing to their wishes however, we have kept the wonderful news to ourselves until now so they could announce it and make a formal presentation at the 1000 Engine Rally in June this year. They have now agreed we can share the good news about their donation and will continue with their plans of making a formal presentation in June. The Committee have also given a donation to Internal Fire in Wales. Geoff Challinor was on the committee for a short time back in the days when the Rallies were held at Tatton Park. 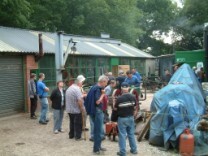 The 1000 Engine Rally is now held at Astle Park in Chelford and many exhibitors feel that part of the fun of coming to the Rally, is visiting the Anson Engine Museum on the Saturday evening as part of their annual pilgrimage. The museum will once again have a marquee at the Rally with a display of engines and selling souvenirs and bus tickets for the Saturday night visit. The Rally will be held on the 23rd and 24th June this year. Full details can be found by clicking here. Why not put the dates in your diary and come along to Astle Park for a great family day out, and for those of you with engines – why not bring them along to help us hit the 1000 engines mentioned in the Rally title? Here are some pictures from last year's Rally and the visit to the museum on the Saturday night. We now have the facility for you to buy gifts and books from our shop via the Internet. Please check out our shop and let us know what you think of our new facility. Have you ever imagined yourself flying, hurtling through thin air, plunging down and rising up with wind roaring in your ear? The idea of being strapped to the top of a plane and then having it take off is the preserve of dare-devils and day dreamers but for Margaret Hacking this incredible adventure is to become a reality and all to raise money and awareness for the museum. The wing walking team at Rendcomb airfield in Gloucestershire are allowing Margaret to join their team to carry out the daring deed. She will be pulling up to 4G (4 times own body weight) when the biplane loops, rolls and turns through the sky against 150 mph wind pressure. She says “I hope to be waving and smiling on the wing but I might just be shouting for my mum!”. Margaret has set herself the fundraising target of £2,500 and donated £500 of this herself to pay for the actual wingwalk. She had won the money as part of the “Inspiring Woman Award” in 2006 for her work at the museum. The wing walk is planned for early May and Margaret is hoping the weather will be a little warmer than it is currently. If you would like to wish her luck or make a donation click here. We will keep the website updated with her progress. The museum was once again a key recipient at the Cheshire Awards for Tourism Skills (CATS) at a Magic of the Orient themed evening at Tatton Park on Thursday 16th November. At a glittering award ceremony, a packed room of over 300 managers, professionals and employees from the North West’s Tourism Industry, were spellbound listening as the shortlist and then winners for each category were read out. 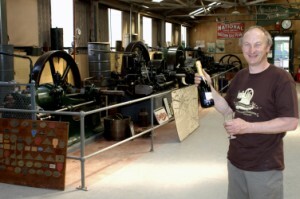 In the “Tourism Team of the Year” category, the Anson Engine Museum's “Rattling Monsters Exhibition Team” was short listed from the 13 nominees in that category. Fantastic achievement for a group of volunteers who were pitched against some of the major tourism and hospitality sites in the county. An even more hotly contested category was for the individual who had shown loyalty, commitment and whose contribution to the industry has been exceptional. 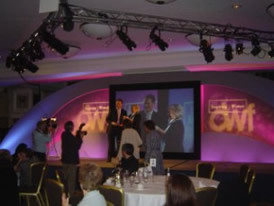 Margaret Hacking was the winner of the “Commitment To Industry” award. She picked up the Gold certificate, an engraved trophy and a “night in the Penthouse Suite” courtesy of The Quay Hotel & Spa in Conwy. The judges were particularly impressed with her ability to inspire and energise everyone she meets. They stated that “Margaret had made a huge difference to the museum’s profile, processes and profitability” and paid tribute to her loyalty and dedication. Margaret who lives in Knutsford, runs her own successful Training Consultancy business (Aim 2 Succeed) but still manages to give a great deal of her time in a voluntary basis to help us become more business-like and better known. She confesses to knowing very little about engines but helps in other ways around the museum bringing her energy and enthusiasm to bear on everything she tackles. Margaret also won the Inspiring Woman Award earlier this year, which recognizes the achievements of women in the categories of Business, Community and the Arts. As well as the Heritage Award presentation, the museum was holding its annual “Turn the Clocks Back” rally weekend to mark the end of a successful summer season. 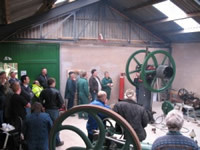 Between the two main buildings several visiting rally engines were on display, including engines from the North West Stationary and the Macclesfield Vintage Machinery Clubs. On the Sunday in this area there were some 22 engines, a display of Honda motors and an open sided vehicle with 3 steam engines running as well as the museum’s own early “A” frame engine mounted in a trailer. 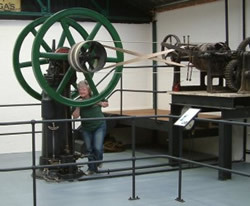 In the new Memorial Building the giant Stott Steam Engine was turned over to show visitors how far the restoration work is progressing. The volunteers were able to show photographs and examples of the metalwork to demonstrate the before and after of the restoration process. In the Gardner room the 4L2, the Robinson hot air engine, the 4T5 and the 4FHM were running for several hours. 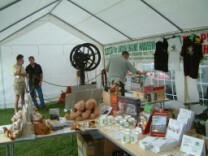 The Rattling Monsters were demonstrated throughout the weekend, including the visiting full size replica engine. 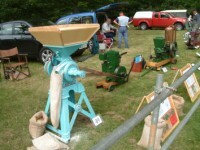 There were four model engines on display including a Bamford “TulipTop” and a Crossley 1060. Flywheels were spinning everywhere you looked. 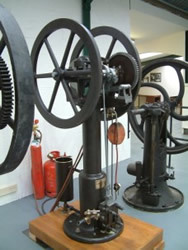 The sectioned Paxman Ricardo engine was much appreciated by visitors, allowing them to examine the internal workings as the pistons pumped up and down. In the main room there were up to seven of the large engines running at any one time, the Furnival and its Printing Press were running and outside in the sunshine the “Bodging and Crafts” area were demonstrated by one of the volunteers. There was a great deal of interest in the Doxford engine parts that had arrived on site, particularly the timing chain and big end which were on display in the Memorial Building. A “Guess the weight of the big end” competition helped to boost the appeal to Save the Doxford and was won by Yvonne Stott who correctly guessed 12cwt. This caused much amusement and some embarrassment to the many experienced engine men who had not correctly estimated it. 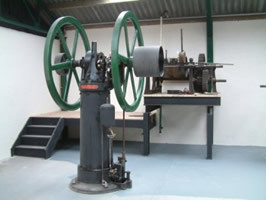 Another attraction that caused great amusement was the “Imaginary Engine Display” the museum hosted, inspired by the empty gallery at the Cardiff arts centre. Visitors were invited to imagine their favourite engine, then picture it in the empty space reserved, and then to share their ideas with others by writing down the name/details of that engine. The museum now has a list of the types of engines that people would like to see and will try to work some of these into their future exhibition plans. The “Friends” society at the museum has over 120 members with 45 of them attending the museum over the weekend to enjoy one of the busiest weekends of the year. Jack Timms was signed up by mum and dad to become the youngest life member of the “Friends”. Jack is only two but is already mad keen on engines. He is very proud of his membership badge (with of engine logo on it) and would not give it up even at bed time, insisting he wore it on his pyjamas. It is not just the “Friends” numbers who are growing, visitor numbers at the museum are up 52% on last year with several club visits also booked throughout the closed winter period. Visitors had come from all over the UK for the weekend, including one gentleman who had come by train from Richmond, Surrey and another from Kent. Another was a chap who had traveled from Devon by motorbike, stopping overnight with a friend, the trip was a birthday treat he was giving to himself. Two “Friends of the Museum” came down from Kinross and stopped in a local bed and breakfast; they visited on both the Saturday and Sunday and were delighted with the changes since their last visit. We also had a visitor from Australia who had left his family in London while he nipped up to Poynton for the day on the train. On his travels he met a gentleman from Portsmouth who was also visiting us by train and they managed to share a taxi from the station to the museum. The Milk Van was on site over the weekend, cheerfully manned by Cheryl and Eric Barlow of Romiley. They kept everyone fueled with bacon butties and hot drinks. Many people declared that Cheryl’s milky coffees were the best to be found. On the Sunday the car park was overflowing with many vehicles being parked up the driveway to the museum and making good use of the large overflow car park in the yard next door. Excellent autumnal weather allowed everyone to get out enjoying the outdoor exhibits and making the last of the summer sunshine. For those that needed a rest, various videos and slide shows were shown, some showing the progress of the museum throughout its history. The comfy chairs proved too tempting for some - all these engines can wear you out. The Trustees and Volunteers at the museum were delighted with the turnout to help us say goodbye to another year. As the engines are drained over winter to prevent frost damage, it is not possible to run engines so the museum volunteers use this period to do much of the restoration and building work. The museum reopens on Easter Sunday 2007 for the summer. Thank you to everyone who helped make it such an enjoyable and successful summer. The museum received another award on Saturday 28th October when the “Rattling Monster” Exhibition was presented with a Heritage Award by the Institution of Diesel and Gas Turbine Engineers (IDGTE). This was the first date available to fit in the presentation, even though the museum had been told in July that it had received this prestigious award. 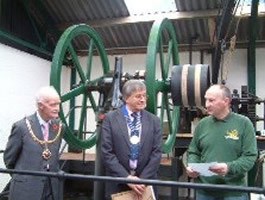 IDGTE President Trevor Owen had visited the Museum in June and had been shown the “Rattling Monster” display. He commented “I immediately realized that this was an exceptional display from the earliest days of the internal combustion engine and that the display was worthy of consideration for our Heritage Award as a unique example of such engines in working order.” He commented on the fact that Geoff now had a unique hands on knowledge of these extraordinary old engines. Trevor explained that they had been thinking about Heritage Awards for some time and had been wondering what was sufficiently remarkable to be presented with such a distinction. In June when he looked at these engines, he realised he had found what he was looking for. Also present at the ceremony were the Mayor & Mayoress of Macclesfield, Sir Nicholas Winterton (Patron of the museum) and representatives of Cheshire County Council and Poynton Parish Council. Their were also many members of the museum's "Friends", IDGTE members and visitors in attendance swelling the numbers to over 80 crowding into the Rattling Monster room for the presentation. The exhibition of atmospheric engines has received praise from enthusiasts from all over the world and is also proving popular with the non-specialist visitor, as it gives a very easy explanation of engines and allows everyone to understand how these early engines work. When they are fired into life it is very easy to hear how these atmospheric engines achieved their nickname of “Rattling Monsters”. After a very successful summer season the museum will close over the winter from the end of October. This means there are only a few occasions remaining for you to visit this fascinating exhibition. The Warren family held the manor in Poynton until 1801 when Sir George, the last surviving male, died. 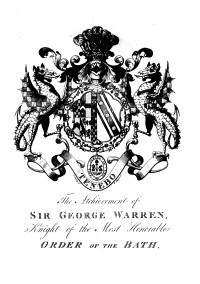 He was succeeded by his daughter, Lady Warren Bulkeley. She died childless in 1826 when she left it to Frances Maria Warren, Lady Vernon. The Lords Vernon held the estate until the final sale in 1920. Several halls were built on the site in Poynton Park, each one then demolished to make way for a new one. The last hall, Poynton Towers, was finally taken down in the 1930s. The Warren, Anson and Vernon families have been instrumental in moulding the history of Poynton and the exhibition helps trace their connections and their influence on the town. Normal museum admission fees apply but no additional charge for the history exhibition. We have had a busy few months with group visits as well as our usual opening hours and times. 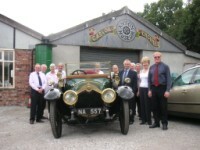 They have included the Friends from Ellenroad Steam Society; Rolls Royce Enthusiasts Club; Probus Groups, Engineering Insustries Association, Manchester Region Industrial Archaeology Society and members of the Peaks and Plains of Cheshire Tourism Association. We even had a visit from the Vernon family who were trying to trace their family tree. Very appropriate at the moment as we are running an Exhibition on the Warren and Vernon families. Here are a few pictures of the groups at the museum. We will put an album of Group visits onto the Gallery area soon. 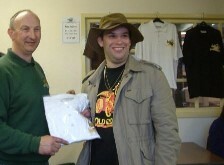 Our 3,000th visitor of the season was welcomed and presented with one of the museum’s personalised polo shirts. The visitor was in fact Alex Smith who is one of the “Friends” of the museum. The museum is due to be featured on this weeks What's On Northwest on Granada TV, Thursday 14th September at 19:30. For those with digital satellite Granada can be found on 10758MHz, Vertical, Symbol Rate:22, FEC:5/6. For those with Sky Digiboxes use Services System Setup Add Channels, enter the details above and then choose Find Channels. Granada should then be listed select it to add to your Services Other Channels menu. All this plus keeping the museum open and engines running from Friday to Monday. Somehow, we managed to achieve it all and the comments from visitors showed they had all enjoyed it. 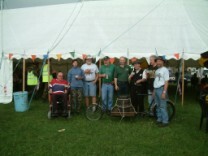 Geoff Challinor attended the Poynton Show to award the Les Cawley Memorial Trophy. This year it was presented to Julian Whitehurst from Wilmslow who was showing a 1940 Lister D (1/2 hp) that was running a beautifully restored Bentall Mark J Corn Mill. Julian told us that the ground corn made good bird feed but he wasn't too keen on the idea of trying it in a loaf of bread for himself. A crowd of 85 gathered on Monday 21st August to witness the unveiling of the commemorative plaque at the Anson Engine Museum by a 12 year old Poynton lad. 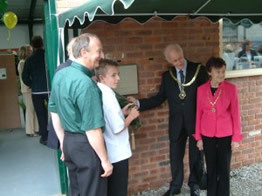 The new building was being named the “Les & Ena Cawley Memorial Building” and among the dignitaries not asked to carry out the official unveiling, were The Worshipful, The Mayor of the Borough of Macclesfield, Councillor Jim Crockatt; The Mayoress; Sir Nicholas Winterton MP and representatives from Cheshire County Council, Macclesfield Borough Council and Poynton Parish Council. Far from being upset about this apparent snub, the assembled dignitaries were delighted by the museum’s choice. Geoff Challinor, Chairman, explained how the Trustees and Volunteers at the museum had made their choice. To help raise funds for the new building various tombolas, raffles and fundraising ideas had been put in place over the past few years. One of these was to “sponsor a brick” and adults were encouraged to “Gift Aid” their donations so that for every four paid for, the Chancellor would give back the tax money allowing the museum to buy a fifth. 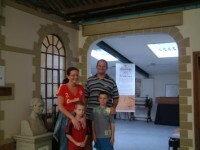 In July 2005, a Poynton family were visiting the museum. They all enjoyed their day out and when they saw the sign about the bricks, the boys asked if they could put their pocket money into our tin. The father said yes and, luckily, the older boy filled in his name and address on one of the “Gift Aid” forms that were lying nearby. Everyone thought the gesture delightful and they knew that Les and Ena would have been thrilled. When it came time to name the new building, the Trustees remembered the little boys who gave their £2 to help. They found the form that had been filled in and contacted their parents. That is why, despite the many dignitaries that were present, the plaque on the new building was unveiled by Niall Magee from Poynton. After admiring more of the museum’s exhibits the visitors were then treated to tea and cakes. Niall admitted he enjoyed the cake eating part more than the speeches. A group of 12 Australian visitors dropped in to visit us on Friday 11th August. They are over in the UK from the Ballarat Engine & Machinery Preservation Society, Victoria, Australia for an extended vacation in the UK. Having been planning their trip for over ten months, the museum was on their hit list to visit. They arrived early along with the Ant and Wayne Timms, “Friends” of the museum who took great pride in showing their fellow Australians around the museum and answering their many questions. 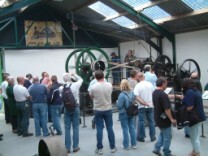 They mingled with the regular visitors and marvelled at the vast collection of unusual engines and machinery. 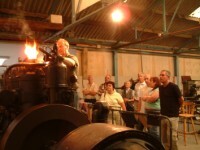 Several engines were run, including the two atmospheric “Rattling Monsters”, much to the delight of everyone. Many of the partners decided to go down into Poynton for a wander around the shops and enjoy a leisurely lunch. They then returned to the museum to collect the true enthusiasts and visit the Anderton Boat Lift late afternoon. The Australian visitors had not realised the museum was so big so despite staying two hours longer than planned, they were persuaded eventually to leave the engines behind and continue with the planned trip to Northwich. A quick trip round the gift shop first meant they took away many mementoes of their visit. Some of the guys wanted to come back to the museum on the Saturday morning but their long suffering partners explained that they wanted to see more of the Chester & Cheshire area. They asked where would be a good day out for everyone for the Saturday so we advised them to visit Chester with its many attractions, shops and wonderful ambiance. 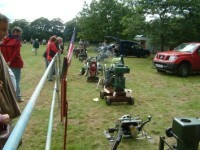 The group were then intending to visit the Steam Rally at Astle Park, Chelford on the Sunday. We waved goodbye to our antipodean visitors, delighted they were going away with such positive memories of their visit to the North West. 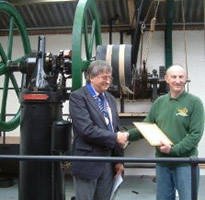 The Institution of Diesel and Gas Turbine Engineers (IDGTE) has awarded the Rattling Monsters Exhibition at the museum one of their very first "Heritage Awards" on 20th July. The Institution is an independent professional body serving the Diesel and Gas Turbine Industry as a whole. 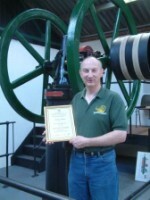 The award is in recognition of the coMntribution to engineering heritage in the restoration to working order of early internal combustion engines in the "Rattling onsters" section of the museum. There will be a formal presentation of the award later in the year. The exhibition of atmospheric engines has received praise from enthusiasts from all over the world and is also proving popular with the non-specialist visitor as it gives a very easy explanation of engines and allows everyone to understand how these early engines work. When they are fired into life it is very easy to hear how they achieved their nickname of Rattling Monsters. IDGTE President Trevor Owen visited the Museum on 21st June for the Midsummer Mingle event and was shown the “Rattling Monster” display. He commented “I immediately realized that this was an exceptional display from the earliest days of the internal combustion engine and that the display was worthy of consideration for our Heritage Award as a unique example of such engines in working order.”. The museum has two working exhibits of atmospherics in the exhibition, a model (made by Wayne Grenning) and this week, has taken delivery of more early engines on loan from the National Museums of Scotland that will further enhance this world first collection. Many visitors to the Collieries Exhibition at the Anson Engine Museum tell the staff they hadn’t realized that Poynton used to be a thriving mining community. The pictures, maps and artefacts in the exhibition tell the story of the collieries from their early days through to peak production in 1859. Coalmining had a profound effect on the village and without it; Poynton would look very different today. At one point Poynton collieries produced 244,516 tons of coal or about 1/3 of all coal produced in Cheshire with over 400 men working underground. There were over 60 mine shafts dotted around Poynton. After being the main industry for 150 years the last Poynton pits were closed in 1935. As well as the Collieries Exhibition which runs until the 23rd of July, visitors will be able to enjoy the impressive collection of over 200 engines at the award winning museum, many of these are restored to their original working condition. A new exhibition on the Vernon Family will replace the Collieries Exhibition from 4 August -29 October so visitors only have a few weeks left to enjoy the mining photographs and stories. The museum is open every Friday, Saturday and Sunday (also Bank Holidays) until the end of October between 10:00 - 17:00. 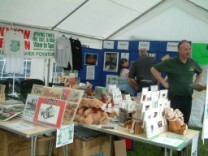 Normal admission prices apply but no additional charge for Collieries Exhibition. Saturday 24th June was a fantastic night at the museum with 225 visitors crowding the aisles between 6pm and 9pm when we opened for our annual evening event to coincide with the 1000 Engine Rally at Astle Park. We had a stall down at the rally field selling the bus tickets (both coaches were sold out by 11am on the Saturday) memorabilia and displaying the replica Otto, Langen & Roosen atmospheric engine built by Wayne Timms and Dave Allen. 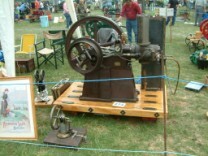 The engine ran both days of the show and attracted many onlookers to marvel at its design. Having the opportunity to see one of these engines running allowed people to really understand the workings of the system, much better than reading an explanation in a book. On the Friday evening Geoff showed film footage of the removal of the air blast injection Mirrlees engine that was recovered from the Manchester Ship Canal, and some film showing how the museum has developed over the years, and included footage of when the buses arrived on their annual pilgrimage. A good crowd gathered in and around the tent, swapping stories and drinking the amber nectar to keep things well lubricated. People were able to recognise themselves on the films and guffaws of laughter erupted as various characters appeared on the screen – with a lot more hair than now, and a lot less weather beaten. All the volunteers were called into service on the Saturday to man the shop/café and to get the engines running. It was a little overwhelming at times at the reception desk having so many visitors arrive at once but our system of numbered tickets really helped us keep control of the situation and allow us to accurately count heads. Our thanks to everyone who helped make the evening such a success. Over the course of the evening there were twenty engines and models running including both atmospherics, the huge Gardner 4T5 four cylinder/two stroke, the Buntinsdale Blackstone, Andrews Gas Engine, National Oil Engine and our only American engine Les’s Ingeco which he used in his timber felling days. All too quickly it was time to “get back on bus" and the visitors made sure they checked their raffle tickets before disappearing. Many vowing to buy their bus tickets early next year so they can come again. Photographs will appear soon in our Gallery section. As part of the sixth International Museums Weekend there was a live broadcast from the museum thanks to a member of our "Friends" Rob Linton. Rob set up his impressive collection of radio paraphernalia and aerial then broadcasted live over the airwaves. Among the many museums he was in touch with were the Museum of Flight near Edinburgh, the Tuxford Windmill, the Imperial War Museum at Duxford, the Ribble Steam Railway & Preston Docks and the Museum of the Royal Arsenal at Woolwich who were celebrating the 150 year anniversary of the Victoria Cross. The special event this weekend is targeted at joining up museums across the world by asking "hams" to set up a station in their local museum. Our thanks go to Rob for helping us to join in the fun and with the interest shown by our many visitors it looks like he has just given himself a booking again for next year. 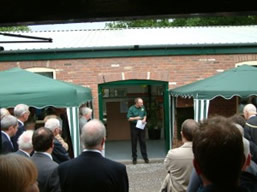 Friday 9th June marked a 20 year landmark at the Museum. It was the anniversary of when the very first foundations were laid on the site. Geoff Challinor remembers it well as he was on his honeymoon at the time! Geoff was married on the 7th but came back to the museum just two days later as they were expecting their first delivery of Ready Mix Concrete. He says that delivery was the first and last – after that they mixed and laid everything by hand – and he felt he could not let his colleagues down so came in on the 9th to lend a hand and shovel concrete into the foundations. Les Cawley had a hobby of restoring Internal Combustion Engines and showing them at local shows with his wife Ena and his friend Geoff Challinor. They went to rallies around the country and met lots of friends and fellow enthusiasts. After dragging the engines on and off yet another trailer one wet weekend, Les and Geoff decided that as the engines were getting bigger and grander, it would make more sense to have the engines in one place and bring the visitors to the engines. 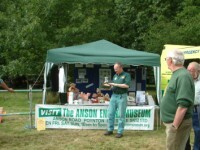 The Anson Engine Museum was born. Plans were drawn up and footings were dug. Brick by brick, wall by wall the museum was built by hand - roping in the help and support of families and friends. Sadly, Les died four years ago in July, but Geoff has carried on the good work and his efforts have seen the museum grow from a private collection to a respected museum attracting visitors from across the world. All this has been achieved on a shoestring budget with a workforce made up of volunteers. As well as an impressive collection of over 200 engines (many built within 25 miles of the museum site) the museum hosts an enviable collection of local history items such as photographs, maps, mementos and keepsakes from the Vernon estate and local collieries. The museum has two major exhibitions running this summer – one on Poynton Collieries and the other a world first of atmospheric gas engines or “Rattling Monsters”. We are delighted to announce that our website has been shortlisted for this years award. The other sites shortlisted with us are Chester Zoo and English in Chester (a privately owned, city centre school of English as a foreign language). The winners will be unveiled at the glittering ceremony at Chester Racecourse on 9th June and presented with their prize by guest presenter celebrity chef Nick Nairn. Adding to the growing number of awards won by the museum, its engines and staff, is now the prestigious Inspiring Woman prize given to Margaret Hacking for her voluntary work at the museum. At a glittering award ceremony at the Midlands Hotel, Manchester, a packed room of over 300 was spellbound listening as the finalists were interviewed by Trevor Green to explain more details behind their short listed nominations. The Inspiring Women Awards was set up to honour the achievements of women in the categories of Business, Community and the Arts. 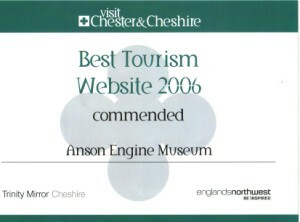 “The Anson Engine Museum in Higher Poynton was one of the best-kept tourism secrets in Cheshire, and might have remained so if it wasn’t for the efforts of our very valuable volunteer – Margaret Hacking. “Margaret first began helping at the museum in September 2003. In the intervening period she has made a huge impact to the profile of the museum, our income generation and the efficiency of our administrative systems and Trustees meetings. “As well as running her own successful Training Company (Aim 2 Succeed), Margaret gives a huge amount of her time to helping the museum become more business-like and better known. With energy and enthusiasm she ploughs through the work – organising, planning, chatting to customers and running our small café/shop. “Visitors comment on how much we have achieved in the past few years and how much more professional we appear. We still have the same basic engines but we now display them differently …. our visitors comment on how they are made to feel personally welcome from the moment they arrive. She treats everyone as a VIP from the Mayor of Macclesfield to babes in arms. Before presenting the winning prize, former MP Michael Portillo read out another comment from the Trustees: “Margaret has been a massive boost to the Anson Engine Museum. Her commitment to her work and the future of the museum cannot be faulted. I’m only pleased she’s a volunteer; we certainly couldn’t afford to pay her." All the winners were presented with a crystal plaque, flowers and a cheque for £500. Margaret says she wants to donate her cheque to the museum. “I shall make sure I gift aid it” Margaret added laughing, “that way the museum will benefit from a further 28% tax relief”. This magnificent replica has been lovingly built by Wayne Timms and Dave Allen (members of the Friends of the Anson Engine Museum). It is of engine number 361 in Aachen, Germany that was originally built in 1871. It has a bore of 5"
The engine will be at the museum 13th May – 27th May (after which they will be taking the engine over to the Nuenen rally) as part of the Rattling Monster Exhibition. This morning was the first public running of this magnificent engine and it ran beautifully - almost too quiet however for a Rattling Monster! Having had the huge 3bhp engine running just beforehand, it was very noticeable how quietly Wayne and Dave have managed to make this run. A real change in engineering standards and techniques over the years from when the 3bhp had been built in 1877. 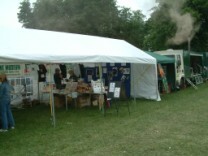 For more pictures of the engines and Exhibition, see the Gallery. The final preparations for the Rattling Monsters Exhibition are underway to make sure we are ready for Saturday 13th May - handrails are being painted and erected; exhaust pipes finished; interpretive material run off; engines polished and commemorative booklets printed. The Exhibition is already proving to be a great draw with many clubs booking visits throughout the summer so they can catch the Atmospheric Engines running as well as the usual museum engines and displays. The Rattling Monsters Exhibition starts on 13th May and will run throughout the season, every Friday, Saturday, Sunday and Bank Holiday until 29th October 2006. There is no additional charge for entry to the Exhibition. The Easter opening of the museum is always something to look forward to, and this year was no exception. With the huge amount of work the team put in over the winter months, it was wonderful to get such a good response with a large crowd of visitors attending on both days. 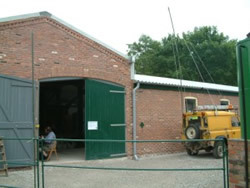 With the new engine house nearly completed, visitors, friends and volunteers spent time seeing how the building had progressed and what a marvellous new space it has given us. Visitors packed the car park, coming to see the Collieries Exhibition in the newly re-vamped Local History area as well as a huge crowd who had come to admire the engines at the museum and the many visiting “rally” engines that were running. 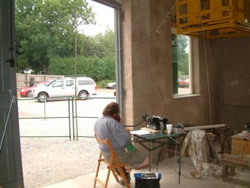 Alongside all this was the preparation for the new ‘Rattling Monsters’ Exhibition that is due to open on the 13th May. As you may know, we have been able to secure some amazing new exhibits on loan from the national museums. 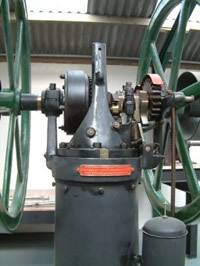 A 3hp atmospheric gas engine built by Crossley Brothers in 1877. A couple of ‘Friends of the Museum’ spent some time on the Sunday coaxing this giant back into life after 80 years, much to the delight of everyone present. You have to see this free piston engine run, there’s nothing like it! A 22hp Ackroyd coupled to a fog horn compressor, not yet in running order but quite an unusual beast. some early slide valve engines which we hope to have in running order by the end of the season. 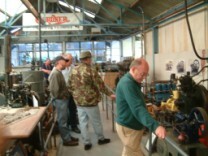 13th April 2006 - Would you like to build an engine at the Anson Engine Museum? We are giving you the opportunity to build a Gardner 4T5 at the Museum. Well, it is in jigsaw form but we are sure you will enjoy putting it together. The record for assembly to date is 4 minutes 29 seconds for this 50 piece puzzle. Let us know if you manage to beat that time. We have other jigsaws available for sale (some with 260 pieces!). You don't have to complete the jigsaw in one session. You can Save and Load positions from the File menu. You also get asked if you would like to save your position when you close the program, as above. The museum was once again host to the AGM of the Gardner Forum on 1st April 2006. The meeting was due to start at 2.30 but many members turned up early to make the most of having a look around the museum to see the many changes that have happened over the winter. The visitors said they were amazed at the transformation we had made and several have promised to come back over the summer when we are fully up and running. The museum does not officially open until Easter Sunday this year, so getting the meeting area and cafe ready for use two weeks ahead of schedule did cause a flurry of activity with the volunteers this week. Just before the meeting took place Charles Mills (on of our volunteers) filled the Gardner 4L2 with water, gave it a quick wipe with an oily rag and cranked it into life - first turn kicked the engine into life. The engine has not been run since October but without fail this wonderful workhorse proves its reliability. After the meeting Geoff gave the members an update on what the museum has been doing over the past year and explained about the major exhibition of Rattling Monsters we have planned for 2006. 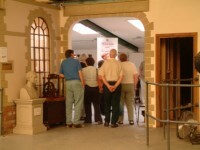 One of the old films about marine engines was shown, then people were free to wander around the museum to explore. The last visitors did not leave until 6.30, everyone had enjoyed the afternoon and expressed their great admiration for the work that has been done since last year. 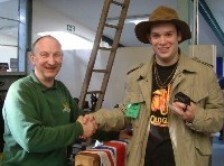 The annual club auction for the local Vintage Motorcycle Club was held at the museum on Sunday 26th. Despite the cold and damp February day, over 50 people had ventured out to join in the fun when the first lot was sold at 11:00. Various engine parts, tools and magazines were among the goods donated by club members. Spirits were high as the auction commenced and bidders were cajoled into vying with each other for lots. The car park was full to bursting as more people arrived and the early arrivals set off for home with their booty. The club declared their auction a great success and have asked to return to visit the museum during the season, taking away a club booking pack to discuss at their next meeting. The club chairman thanked the museum for all their hard work putting out the tables for the sale and providing the numerous cups of tea and coffee that had been drunk during their visit. It was 20 years ago this summer that the foundations were dug for the first hall at the museum. The museum opened to the public 17 years ago and over that time it has changed and developed to be an award winning attraction in Cheshire. • 200 engines varying in size from desktop to 63 tons! • Ample room for wheelchair access throughout, wide doorways and a one-level floor surface. Easter Sunday and Monday (16/17 April) will see the start of our 17th season at The Anson Engine Museum. Many engines will be running over the opening days and visitors can see the many changes including our new Les & Ena Cawley Memorial Building. The museum will be open from 10:00 - 17:00 those days and then every Friday, Saturday, Sunday and Bank Holiday until end October (other times & days by arrangements for group visits).